Our office would be nothing without our fantastic team! They’ll greet you at the door with a smile, clean your teeth thoroughly, and do everything they can to make sure you have a smooth and positive dental experience. From your first phone call to when you leave our office with beautiful teeth, they’ll be right there with you to make sure you have everything you need. 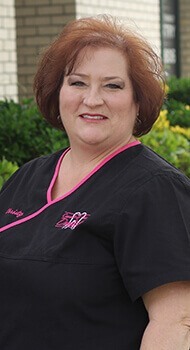 Christy has been a hygienist at Cosmetic & Family Dentistry of Weatherford since 1995. Christy helps patients with regular cleanings, periodontal treatments, X-rays, sealants, and education. She also manages our Facebook page, in-office slide show, and community involvement. She was born and raised in Texas, and she’s been in Weatherford since 1980. Her educational background includes two years at Southwestern Oklahoma State University and an associate’s degree from Tarrant County College. Her continued education includes orthodontics, Invisalign, OSHA, implant placement, periodontal treatment, head/neck cancer, obstructive sleep apnea and vitamin/supplement courses. She enjoys the camaraderie in the office, the state-of-the-art equipment, and the friendships she has formed with her patients over the years. For Christy, dental hygiene is an opportunity to help people improve their dental health and understand the link to their overall health. She’s been married to her best friend, Leonardo, since 1989, and they have two grown children. Her house is never quiet though-- she and her husband have 5 spoiled dogs and 1 spoiled cat. During her free time, she is involved with her church family and loves to volunteer. She also enjoys photography and camping in her vintage camper. Christie is a native Texan who was raised in Mansfield. She moved to the Weatherford area at the beginning of 2015. She was excited to become a part of the Weatherford community and started working at our office in the spring of 2015. Christie graduated from the TCC Dental Hygiene program in 2013. She has a passion for patient education and working with each person on their individual needs. Before becoming a hygienist, she assisted in endodontics for three years. In her spare time, Christie enjoys spending time with her husband, daughters and several animals- which include 4 longhorns, horses, a mini donkey, and several dogs! 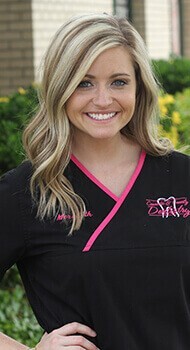 Meredith came to our office in 2015 and loves her career as a dental hygienist! She graduated from Midwestern State University in Wichita Falls, TX in 2009 with a Bachelor’s of Science in Dental Hygiene. She grew up in Springtown, TX and after living the “city life” for a couple of years following college, she decided to move back closer to the area she calls home. Her favorite thing about being a hygienist is helping people achieve overall health while also developing relationships with her patients. 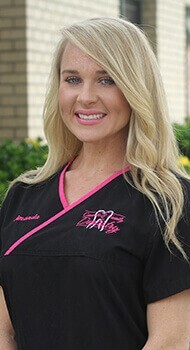 Cosmetic & Family Dentistry of Weatherford really cares about each and every person that walks through the door, and that is what Meredith enjoys the most about working here. Meredith loves to laugh and enjoy life. Her favorite hobbies include spending time with family and friends, traveling, playing sports, watching football, shopping, and reading. She strives to live a Christian life and loves the Lord. Kelly is in charge of making sure things run smoothly, confirming appointments, pulling charts, filing, billing, and treatment plans. She’s been in the profession for over 22 years, and she’s been part of our team since 1998. She attended Weatherford College, and she’s certified in scheduling, TMJ, sleep apnea, orthodontics, dental implants, and CPR. She’s also a certified financial arrangement specialist. For Kelly, interacting with patients is the most rewarding part of her job. She likes knowing we can turn a frown into a smile. She’s outgoing, too. For fun, Kelly enjoys shopping and spending time with family and friends. She’s married with five kids. Kristy is responsible for helping people book appointments, checking patients in and out, and assisting the doctors with procedures when needed. She grew up in the small town of River Oaks, TX, and now lives in Poolville. 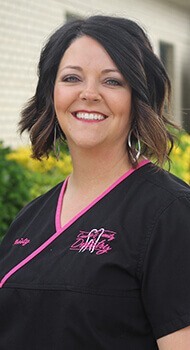 She started with our team in 2012 after completing the Dental Assisting Program at Weatherford College, and she’s also been trained in soft tissue laser surgery, nitrous oxide monitoring, CPR, and implant placement and restoration. Kristy also plays a big role in handling the communication between physicians and Dr. Romack for her sleep apnea patients. For Kristy, the best part about working at our office is the teamwork and the family atmosphere. In her free time, she enjoys spending time with her family, watching her son play sports, and hanging out with the family Boston Terrier, Rieley. Jennifer does everything from A to Z and she loves it! She’s been in the profession for over 16 years, and she joined our team in 2013. She grew up in Springtown and now lives in Fort Worth. According to Jennifer, everyone at our office is sweet and kind, and she loves that we do a morning prayer that gets her day going in the right direction. Because she loves helping people and all of her fellow team members, she is a great fit for her position, and she’s awesome at making things fun around the office. She lives by the words, “It’s nice to be important, but more important to be nice.” Her family comes first, and she enjoys cooking, shopping, and spending time with friends. She loves to have a good time no matter what she is doing! Some of the procedures that Jennifer assists with include orthodontics, TMD therapy, and Invisalign. 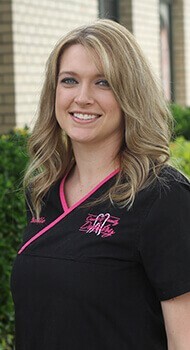 She’s from Aledo, and she’s been in the profession for over 13 years, having joined our team in 2000. She has an Associate’s Degree in Art and an Associate’s in Science, and she’s pursued extensive continuing education and training in functional orthodontics, Invisalign, TMD therapy, implants, laser treatment, CPR, and nitrous oxide sedation. 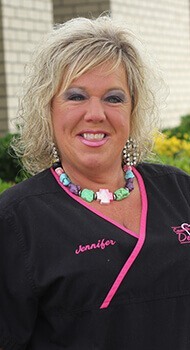 Jennifer enjoys the patients here at our practice, and she likes keeping them on their toes with new information! She’s married with twin daughters and one son, and she really loves being a mom and spending time with her family. She’s dedicated to her church, participating in small groups there and also loves decorating. Amanda was born in the Texas Panhandle and moved to north Texas in 2003. 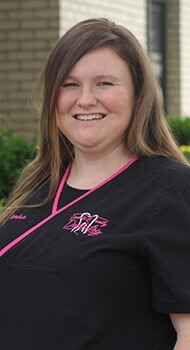 She attended the Dental Assisting program at Weatherford college and has been assisting for 5 years. She assists in all dental procedures, fillings, crown and bridge, root canal therapy, implants, and laser surgery. She is CPR certified and takes continuing education courses each year. Amanda loves being able to get to know each patient and making them feel as comfortable as they can. She recently completed training in Boston to assist Dr. Romack with sleep dentistry. Amanda handles the clinical aspect of the sleep dentistry program. Amanda loves spending time with her fiance, her family, working out, and attending church. Kendra was born and raised in Brock, Texas. She graduated from the Weatherford College Dental Assisting Program. She is CPR and nitrous oxide sedation certified. She joined the office in 2015 and could not have been more excited to work with this dental team. 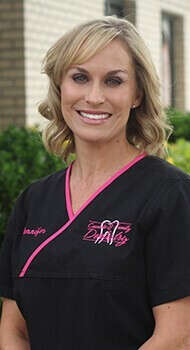 She assists both of the dentists in a variety of dental procedures, including fillings, crowns, root canals, extractions, and new patient exams. Kendra is a great team player and a joy to have around. In her free time, Kendra loves spending time with her husband and new baby girl, as well as her family, and friends. She also enjoys fishing, hunting, and being outdoors.